I love candles. No matter how many I have, I'm always ready to buy more. But, I have never taken them camping with me because of fire safety concerns. I considered using an electric wax melter but it still creates hot wax. Now, I realize I can have candles again because there's now flameless ones available. I haven't bought any yet, but they seem like a great idea and the price isn't too bad. 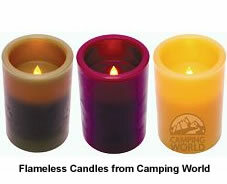 The ones pictured here are available from Camping World for around $10 each. They're lit by a LED light that flickers and glows like a real candle flame. The candles are wax and are scented but the LED light doesn't get hot enough to make the wax melt which eliminates the fire hazard and the mess of melted candle wax. The LED light is supposed to last 100,000 hours but I don't know how long the scent lasts. My guess is that the scent won't last nearly that long, but if scent lasts 2 months it's just as long as my $20 Yankee Candle jar candles last. The candles pictured are 4", use 3 AAA batteries, and are available in either apple, harvest or pear. They seem like good scents but I would really like one that has a vanilla scent. I'll look around. If I find one, I post a link to it. Now, when it's raining outside, you can have a romantic night inside your camper with "candlelight!"